We showcased our range of electrical services at the Johnstown Business Fair recently. At which we launched our latest service available. We demonstrated the Smarthomes system and had a hub on display for the duration of the fair. There was a lot of interest in this piece of equipment, mostly from the lads I have to say. 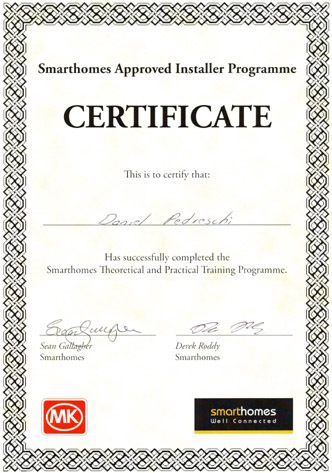 We are delighted to announce that we recently completed the training course run by Smarthomes, to become an Approved Installer of the Smarthomes range of products. We spent four days at the Smarthomes offices in Dundalk getting familiar with both the equipment and the packages available to both the homeowner and the developer alike. Further information on the range of products, the benefits and to see the systems in use follow this link to the Smarthomes website. We will be happy to discuss any queries in relation to the range of products.